Extreme methods are often the sign of true dedication. Sometimes, to prove your mettle you have to go all out. No one respects a half stepper, and minimal effort rarely bears fruit. Such adages are rarely recognized or respected in Hip-Hop unless they apply to business acumen or financial success. A rapper who employs extreme methods in a purely artistic Vein is almost never celebrated. 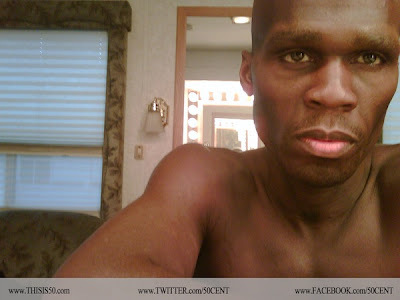 50 Cent portrays a football Player stricken with cancer in the upcoming "Things Fall Apart", which is based on a screenplay by him and Brain Miller. In preparation for the role, 50 put himself on liquid diet and shed 54 lbs. These pictures show him looking nothing like his muscular self. One can imagine any one of these pics gracing the cover of a tabloid under a caption that has him struggling with a mysterious illness. No doubt his transformation will draw comparisons to the extreme methods employed by actors such as Robert De Niro, Matt Damon, Tom Hanks, and Christian Bale. Whether his dedication will pay off with the same praise and accolades visited on the aforementioned thespians remains to be seen. 50's track record as an actor has been less than stellar thus far. Still, you can't say that guy isn't serious about the craft. Let's hope his actual performance turns out to be as startling as the images in these photos. i need to call him, i got a little bit of fat to lose.